Long bike rides are an easy way to burn calories without terrorizing your knees, but it helps to have some tunes to keep things fun. My rides usually take me through bustling urban streets and isolated stretches of waterfront, so pumping out a soundtrack using a Bluetooth speaker is usually a viable option -- mostly, anyway. Unfortunately, the wind-dampened output is never ideal and a high audio volume can burn through battery life, and bringing a backup device adds weight. 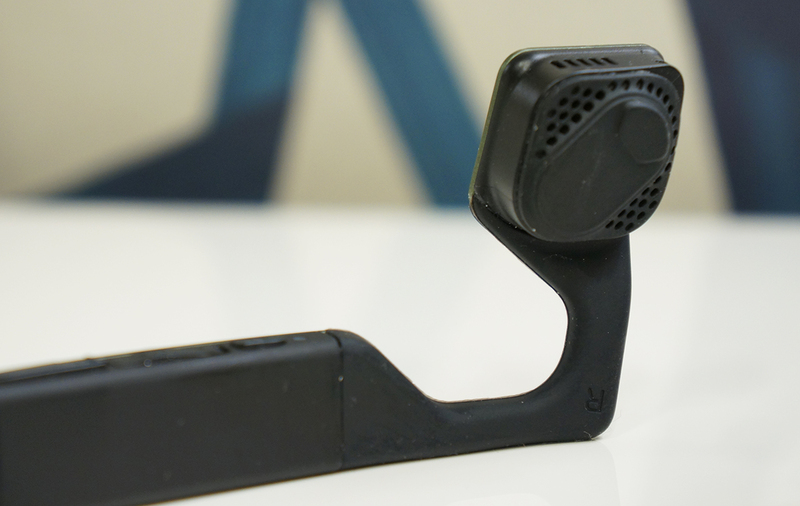 Luckily, the ideal solution recently crossed my desk: AfterShokz's Bluez 2S bone-conduction headphones. If you're not familiar, this style of device delivers audio as sound vibrations to your inner ear through the bone, bypassing the eardrum entirely. I'd never regularly worn headphones while riding, mostly so I could remain aware of traffic and the world around me. (It's also illegal to wear them while riding in New York City, at least in both ears.) I found the Bluez 2S struck the perfect balance between weight and audio output, while keeping situational awareness levels high. The experience is quite different from your traditional headphones, though, so they won't be for everyone. 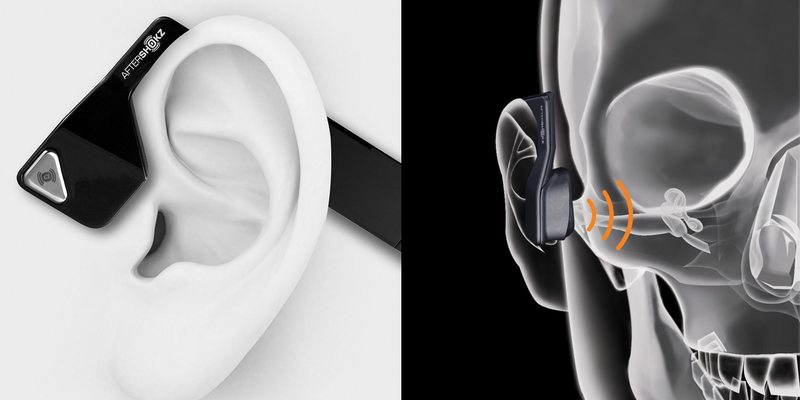 The AfterShokz Bluez 2S is a recent update to the Bluez 2 model, adding the new "PremiumPitch+" technology, which aims to boost the bottom end and prevent sound leakage, alongside slight changes to the external design. There are now perforated openings where the speakers rest on your cheek -- before it was a solid surface. Even with this seemingly more exposed design, the Bluez 2S still meets IP55 standards for dust and sweat protection, which I successfully confirmed over an exceedingly hot and humid summer in NYC. The open speaker surface and revamped internals do indeed make a difference in audio quality and volume. It may not be profound, but it's a noticeable improvement over its predecessor. The arrival of the 2S dovetails with the announcement of the company's sporty Trekz Titanium, which hit Indiegogo last month and quickly shot past its fundraising goal. Although we haven't tested those yet, it's easy to see the benefit from the Trekz' flexible design. With the rigid U-shaped plastic band of the Bluez 2S that goes around the back of your head, you can imagine the potential for breaking while bouncing around in a bag. That said, I've had them packed in both full bags and jostling around in sparse ones, and nothing has happened to them in several months of use. Also, the headband does get in the way of sunglasses to a certain degree. Since the speakers work best when resting snugly against the cheek, I've had the arms of the glasses positioned above the band (outside just feels weird), which tends to tilt the glasses down and crowd my face a bit. It's not a dealbreaker, but it's certainly not a great pairing. So how do they sound? First, you need to understand that this is an entirely different experience than regular headphones, with its own set of trade-offs. Music will sound a bit different with this type of technology. The overall sound may be a bit duller compared to your standard cans, but you'll also get a pleasantly spacious head-feel when listening, which is hard to convey. Speech comes across clearly, but the low-end will be lacking in comparison. I frequently have the volume near maximum when I'm hustling on bustling city streets and feeling the music. In quieter environments, however, there's more headroom in volume flexibility. The claim is that PremiumPitch+ helps increase bass, while dampening vibration and reducing sound leakage. The Bluez 2S may not be the loudest pair I've listened too -- Damson's Headbones still hold that title -- but they provide plenty of kick without going overboard on the vibration. It helps to be a glutton for aural stimulation with bone-conduction headphones. Unlike the isolating experience you get with in- or on-ear models, you get both music and ambient sound leaking in -- which is part of the benefit for me. As long as you're not rocking full volume, you can easily have conversations and hear cars approaching from behind, making it a flexible and safer option if music is a must while riding a bike. For the same reason, they're great when you're walking around the neighborhood, but the sound of a New York subway will certainly overpower your tunes. On the hardware side, you get Bluetooth connectivity, a volume control rocker that doubles as a battery check and EQ changer, power and a multipurpose button on the left earpiece. Since I'm right-handed, the left-side button is perfect for me. It can pause/play music, skip tracks, redial the last phone number and take calls with its onboard mic. The battery life is rated at six hours of continuous play and 10 days of standby. Indeed, it's great to find the headset charged after neglecting it for a week. It takes about two hours to charge up, but I've rarely drained the headset fully, so it seems to top off rather quickly for me. Bluetooth range is the standard 33 feet, letting you pair with a computer and wander around the kitchen or nearby room without stuttering. It stays paired with your last device though, so be sure to check it's not still tied to the computer if you leave the house and don't hear your tunes. Also, once paired, if the current track isn't playing still, try skipping forward or back one. This comes at a price, though: The Headbones are more than twice the weight, with a bulky portion that sits at the back of your neck to house the extra flourishes and battery power. Since I ride with a backpack, the hefty rear section bumped up against it making them difficult to wear. While it pumps out a beefier sound, I found the ear (actually cheek) pieces to be a bit too snug and at higher volumes the vibration was uncomfortable. They're definitely a quality set of bone-conduction headphones, but didn't mesh well with my needs and preferences. The bottom line here is that while you're not going to have the same audio experience as a standard set of headphones, the benefits of the Bluez 2S outweigh the negatives, at least for me in how I use them. I get a comfortable, lightweight wireless headset that provides tunes at a respectable volume, while still being able to maintain awareness about what's going on around me -- an ideal scenario for bike riding. 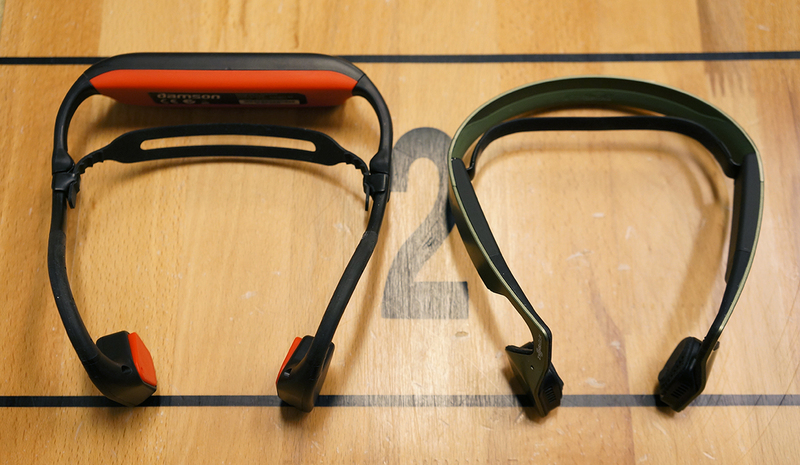 The AfterShokz Bluez 2S is available for pre-order now for $100, while the Trekz Titanium version should arrive in January 2016 for $130.